The Scottish Gamekeepers Association has called on politicians not to bring campaign charities into wildlife crime policing as a knee-jerk reaction to pressure. Scottish government will shortly announce whether to extend the investigative powers of SSPCA in wildlife crime cases, with a public consultation on the subject closed. The idea was mooted back in 2010 during deliberations over the WANE Bill but was dismissed by MSPs and legal advisors. Then Environment Minister Roseanna Cunningham, while supportive of SSPCA’s involvement in wildlife crime enforcement, stressed further powers raised ‘significant issues of accountability’ and noted that SSPCA could not be viewed as a ‘neutral organisation’. However, the unexplained death of 24 raptors in Conon Bridge in March has led to campaign groups exerting pressure upon MSPs to push for new SSPCA powers. It has also led to public criticism of Police handling of the case and assertions officers are too stretched to tackle wildlife crime adequately. However, Scotland’s gamekeepers believe politicians should make the decision on evidence rather than events in Ross-shire. They feel conservation groups have used the incident as a campaigning tool when little is yet known about the case. “There is no doubt Conon Bridge was an appalling crime. All partners and stakeholders in this case hope to get to a situation where there is closure, ultimately a prosecution and appropriate sentencing,” said SGA Chairman, Alex Hogg. “However, we feel it has also become a campaigning tool by certain groups eager to achieve their own objectives. “RSPB Scotland, for example, pushed to make Conon Bridge a case for licensing of grouse moors even though there was no suggestion it was ever anything to do with grouse or shooting of any kind. “We hope, therefore, that politicians manage to separate Conon Bridge from what the possible implications are of having two campaigning charities, SSPCA and RSPB, neither of whom have the same accountability as Police, involved in the delivery of justice. The two issues should not be conflated. “There is certainly no argument to suggest having SSPCA inspectors, with the same evidence to work with as the Police, would have made any difference in Ross-shire. SSPCA has a stated campaigning aspiration of trying to have legal traps and snares banned; essential tools in the control of pests and predators for many who work legitimately in the countryside. However, new powers proposed would enable their inspectors to investigate, amongst other things, cases involving traps and snares. Recently, the SGA highlighted the case of a Perthshire gamekeeper and his family who were put through 18 months of ‘hell’ after a case involving an un-set crow trap brought by the SSPCA. The case was thrown out by the Procurator Fiscal on the eve of trial due to lack of evidence. “Extending SSPCA powers in these areas is opening up the possibility of legal breaches because the SSPCA inspectors can not be seen to be impartial when dealing with these cases. Indeed, there is already concern about the use of the powers they currently hold. The SGA would like to pass on its respects to the family and friends of Ewan Cameron Ormiston, a keen supporter of the SGA and a highly popular and knowledgable figure in stalking circles across the whole of the highlands. Please see the obituary below, kindly provided by Ruaridh Ormiston. Ewan Cameron Ormiston – 07th April 1929 to 29th August 2014 (85 years). Born at Banchor Farmhouse, Laggan Road, Newtonmore. Died at Raigmore Hospital Inverness. Cameron Ormiston sadly passed away peacefully in Raigmore Hospital Inverness on Friday the 29th August 2014 after a short illness. A fit and active man all of his life he was still shifting ponies and going about his daily rounds only a few weeks before he died. Born in Banchor Farmhouse Newtonmore to Ewan and Elcie on the 7th April 1929, he claimed his prowess at shinty came about because his mother walked him through the goalposts on the The Eilan shinty pitch the night before he was born. After some time in Newtonmore school he then went on to be educated at Gordonstoun, something few people would have ever realised. A sportsman all of his life and one of the greatest all rounders in the Highlands, he not only played Shinty, even captaining the team, but was well known on the Highland Games circuit for competing in both the Light and Heavy events as well as running Hill Races and Wrestling. A unique diversity of talent seldom seen today. During his National Service he was a PT Instructor in the army and later on a very keen Clay Pigeon shot like his father, travelling all over Scotland to compete and meet good friends. The family were always associated with The Balavil Arms Hotel in Newtonmore where they helped start the first ski school in Scotland in 1948 and of course they pioneered Pony Trekking Holidays in 1952, two years before anybody else, in association with the Scottish Council for Physical Recreation. Something that grew in to a huge industry through the 50’s, 60’s and 70’s. His dad Ewan was also very well known for his Butchers and Game Dealing business that fed so many during WW2 because most game, especially venison, was not rationed. It is believed they had control of around 700,000 acres of deer forest at this time with teams of stalkers and ghillies, including Cameron himself, heading out from Newtonmore with lorry loads of deer ponies and people to remote estates from Cannich to Islay to harvest this venison, before returning it to Newtonmore to be butchered and wrapped in hessian and put on the train to the cities and eventually Germany too after the war. His real passion however was his Highland Ponies, closely followed by Highland Cattle – traditions that his sons have all kept going today, having inherited his great eye for stock and an ability to work with all livestock. In his early years, along with his father, they had upwards of 300 ponies used for the deer and leased out to Highland estates too, these then became the basis of the pony trekking workforce. There is hardly a farm in Badenoch that Cameron and his father have not farmed at some point, but he is probably best known for his years at Strathmashie Estate at Laggan during the 1970’s and 1980’s, where is own sons learned their trade among the ponies and cattle and also the deer too. His proudest moment in the horse world was when he won Reserve Champion overall of the show in the Fredricks Trophy at the Horse of the Year Show in London in 1966 with the stallion Glentromie Trooper. This was closely followed by another of his stallions Torrin of Croila winning the overall ridden mountain and moorland at Olympia in 2008 for the Stanford family. In latter years he lived at a new house “Mo Dhacaidh” (Gaelic for “My Home”), that he built at Croila Stables in the village, never retiring but still doing his daily rounds of all his animals even at 85 years old. He still attended all local shinty matches supporting his beloved Newtonmore and every week made time to go round and visit all his old friends (and some younger ones) just like his father had done before him. 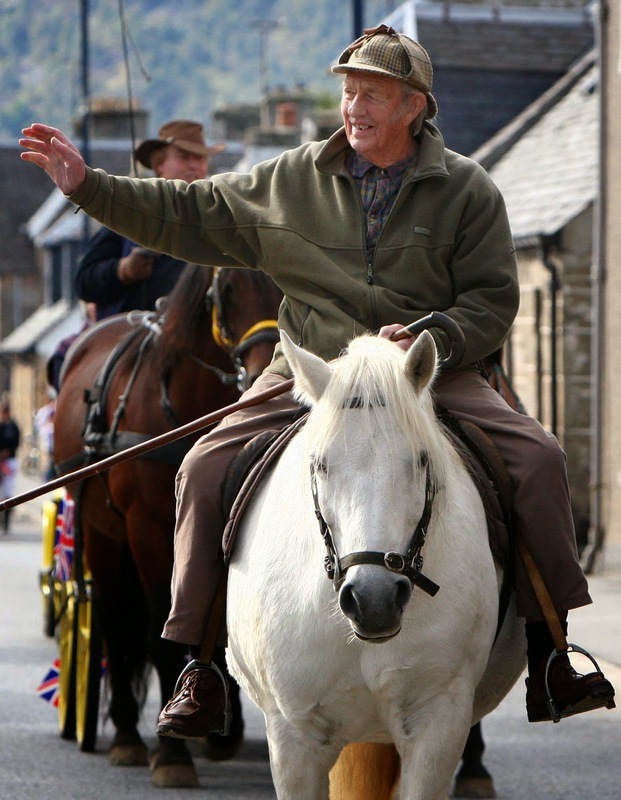 A true Highland Gentleman who meant so much to so many and who will not be forgotten for a long time to come. Funeral will be on Friday 12th September in Newtonmore at 1pm at St Brides Church. SASA has requested assistance from SGA members for the following project on trapping under General Licence. Please see below. Registered trap users working under the General Licences were contacted by the GWCT (Game & Wildlife Conservation Trust) in March and asked to complete a questionnaire on their use of these traps. The next stage of this project is now being conducted by SASA (Science and Advice for Scottish Agriculture), who are asking for volunteers to help keep simple records of their catches and to allow SASA staff to remotely monitor trap activity using trail cameras. If you are prepared to help then please contact Seonaidh Jamieson (seonaidh.jamieson@sasa.gsi.gov.uk; 0131 244 8889). Assisting with these field trials will help to ensure that General Licences remain fit-for-purpose, robust and defensible. We encourage your participation wherever possible.